Slots Capital Casino has just launched a great new jungle-themed slot game from Rival Gaming called Jumping Jaguar. Until the end of this month they'll give you 50 free spins on the new 5-reel slot with free spins bonus features to maximize wins. All players that have made a deposit in September are eligible for 50 free spins. Three or more Golden Jaguar scatter symbols trigger the first free spins round. During these free spins, Silver Jaguars trigger the Hunt Super Round where symbols can become drop icons producing even bigger wins. Slots Capital Casino players can get 50 free spins on the new Jumping Jaguar slot game until September 30, 2017. The Jumping Jaguar is an Expanding Wild symbol that doubles wins and expands to cover its entire reel creating more possibilities for winning combinations. 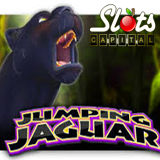 Jumping Jaguar has already made some huge payouts to winners at Slots Capital. Katie S., for instance, won $23,587 playing the new game. 35X wagering requirement, available September 22-30, 2017. 20X wagering requirement, available September 22-30, 2017. 20X wagering requirement, available Sept. 24-30, 2017. 20X wagering requirement, available September 25-30, 2017. Maximum deposit is $500 for each of these bonuses. There is no max. cash out. Slots Capital Casino offers dozens of unique online casino games which are enjoyed by players all over the world. They can be enjoyed on desktop and laptop computers (download or instant play) or in the mobile casino for smartphones and tablets.